Discover Tasmania’s Twisted and Clems Tarn in the Mt Field National Park with us! Grade: T1 – Well defined and wide tracks on easy to moderate terrain, in slightly modified natural environments. You will require a modest level of fitness. Grade: T2 (Rodway Range and Mt Field West) – Narrower but distinct tracks, which can be muddy in some places, in pristine natural environments. Facilities are minimal and you will encounter few other walkers. These moderate tours require a reasonable level of fitness. Mount Field National Park is one of Tasmania’s oldest national parks, established in 1916 with Freycinet NP, and is one of its most popular. This is partly because of its proximity to Hobart (94 km) but also because of its wide variety of flora, dramatic glaciated landforms and ready accessibility to most areas of the park. regions and its flora and topography. 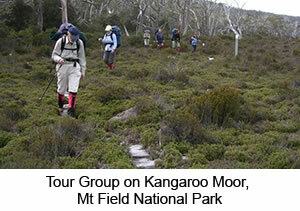 The tour is also characterised by the park?s multiple ‘personalities’ – it starts in a sub-alpine forest along moraine-dammed lakes, and finishes with an exhilarating high altitude ridge-top traverse of the Rodway Range among the ice-shattered monolithic dolerite boulders of the ‘Lions Den’ before descending the botanic ‘riot’ of the Urquart Track to our finish. We leave Tasmania Wilderness Expeditions’ own rural retreat, Base Camp Tasmania, for the 40km drive to the park entrance, passing through the extensive hop fields of Bushy Park en route in the picturesque Derwent Valley. Our park access road gains approximately 1000m of elevation in the 14km drive to our start point at Lake Fenton (the source of 60% of Hobart’s water). On the way we have the opportunity to pause at the ‘Tall Trees Track’ – a 20min walk through the park’s majestic swamp gums (Eucalyptus regnans). From Lake Fenton we walk over an ancient glacial moraine and come face to face with the endemic pandanis (Richea pandanifolia), yellow gums (E. johnstonii), the deciduous fagus or beech (Nothofagus gunnii) and numerous species of mountain berries. We lunch at Lake Webster in the u-shaped Broad River valley, and then climb through a pleasant sub-alpine forest to the Tarn Shelf. We pay a quick visit to the curios in the hut at Twilight Tarn, then on to our evening’s campsite at the delightful Twisted Tarn. After making camp, we then have the opportunity to explore the tarns of the shelf without our packs before our evening meal. Leaving our campsite at Twisted Tarn, we walk to Lake Newdegate Hut (a bad-weather alternative overnight stop) and then climb through dwarf mountain pines and pencil pines to the boggy Newdegate Pass and on to K Col. The character of the walk changes here as we reach an elevation of about 1200m – plants become lower and stunted, the remarkable bolster (or cushion) plants appear, and we become aware of the bleak surroundings. We have the opportunity to scramble across to the Watcher (1294m) and take in the dramatic views from its summit before reaching the high saddle of K Col and Peterson Hut where we break for lunch. A short distance on we set up our campsite at the exquisite Clemes Tarn with spectacular views across to Florentine Peak (1376m) and the mountains further west of the park. From our campsite we can now scramble up Naturalist Peak (1428m) and Mt Field West (1434m) and take in the stunning views from these rugged peaks before settling in for our evening meal. Reluctantly we leave Clemes Tarn and retrace our steps to K Col and climb up and through the horizontal bands of dolerite scree boulders barring our path before traversing the ridge-top of the Rodway Range. This provides more spectacular views either side of the range to the nearby peaks, and even a glimpse of Mt Wellington in the far distance. The jumble of boulders becomes even more chaotic, and we enter the extraordinary ‘Lions Den’ – a short canyon on the ridge crest composed of massive blocks of shattered dolerite strewn in wild confusion – a thoroughly unexpected sight when we come upon it and not quickly forgotten! Leaving the Lions Den we then encounter one of Mt Field’s ski tows and descend from the range through a magnificent stunted forest of snow and yellow gums to culminate in the short Urquart Track to our finish at Lake Dobson among the scoparias (Richea scopari) and pandanis. From Lake Dobson we have the opportunity to drive to the Styx Valley and view the Big Tree Reserve before returning to Base Camp Tasmania where a hot shower and a warm welcome awaits us. 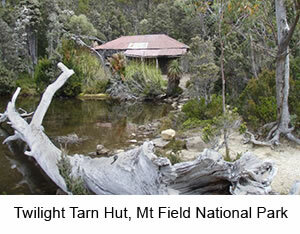 For further information about Mt Field National Park, click here to visit the Parks & Wildlife Service Tasmania website.